I eat chia pudding bowls on the regular. Like ALL the time regular. I crave it almost every morning. It never gets boring because I always switch up the fruits and toppings. Often, I’ll make it with almond or soy milk. But on days when I’m feeling particularly awesome (meaning: days when I feel skinny), I’ll make it with coconut milk. Not the light coconut milk you find sold in cartons. I’m talking about the good stuff. Canned coconut milk! The tasty, creamy, and fatty one. YUM. Chia pudding is magical. As the chia seeds soak and plump up in the delicious coconut milk, it absorbs its tropical flavors. The end result is this rich, silky pudding. One day I made too much. 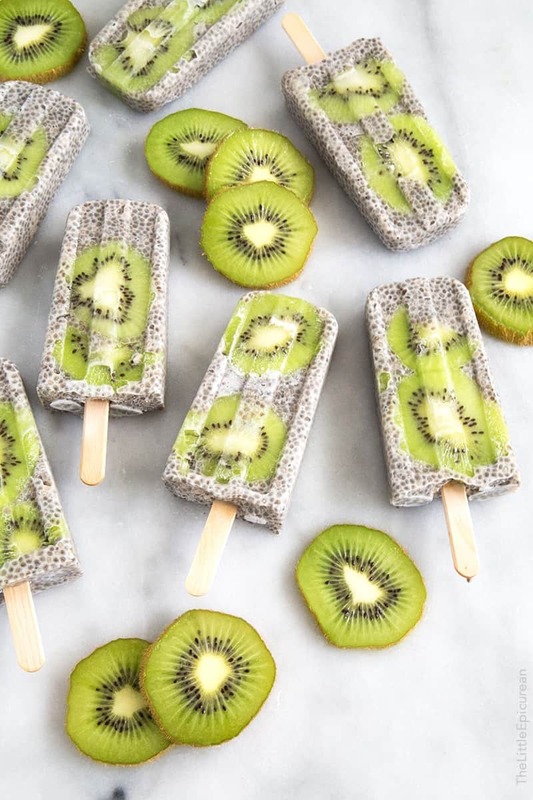 Rather than store it in the fridge, I poured the chia pudding into popsicles molds and popped them in the freezer. Frozen chia? Is that good? YES. It’s amazing. 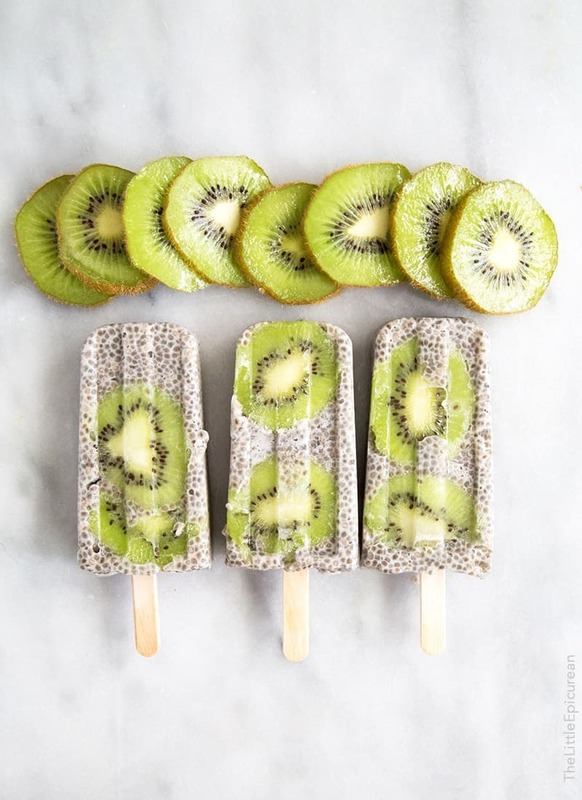 Slushy kiwi slices, tropical coconut, all frozen in a portable stick? The rest is history. 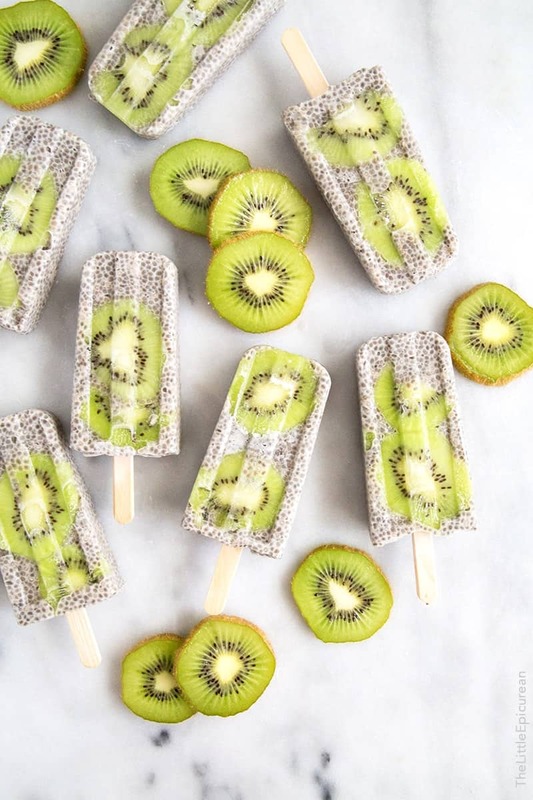 I’ve been making these chia popsicles will all sorts of fruits. Mix it up with pineapples, strawberries, or mango. I can’t wait for stone fruit season so I can experiment with peaches, plums, and apricots! Summer… are you here yet? Gently pour liquid mixture into popsicle molds. Insert wooden popsicle sicks. Freeze for at least 4 hours until popsicles are solid. These scream summer! Saving coconut milk for skinny days is supper smart! Can’t wait to make! Thanks! These look really delicious!! Is it possible to substitute the coconut milk with cows milk, or will it ruin the recipe? Or is it possible to just use soy milk for the whole recipe? Thanks Jocelyn! If you substitute the coconut milk, the popsicles will not be as creamy. If you use cow’s milk or all soy milk, the popsicles will be very icy. Is it canned coconut milk or canned coconut cream? Under the ingredients, it is listed as canned coconut milk. However, if you’d like creamier popsicles, you can use coconut cream. these look so great!! does almond milk work too or just coconut milk? Thanks Hannah! You can use almond milk, but the popsicles won’t be as creamy. With almond milk, they will be a bit icy. I wonder if using homemade cashew cream (instead of coconut milk) would provide creaminess and not get icy. Will have to try this – thank you for sharing the recipe! i’m allergic to coconut . would canned condensed milk work ? ? ? these look AWESOME ! ! ! really want to give them a shot . . . .
No, canned condensed milk would be too sweet. It would throw off the balance. If you can’t consume coconut, you can try other alternative milks but the resulting popsicles may not be as creamy. Hi! Your recipe seems really delicious to me. I’ll definitely try this! Can i use other types of sweetener… like sugar or honey? Hi there! What do you mean by “1/4 + 1 Tbsp cup chia seeds” – is it 1/4 cup PLUS 1 Tablespoon? Thanks!! Thanks for catching that! It’s 1/4 cup + 1 Tbsp of chia seeds. So you don’t have to make the chia pudding ahead of time? You just mix it up right there and pour it directly into the molds? Do the chia seeds have enough time to get soft that way? I mixed together the chia pudding and directly transferred them to into the molds. It takes a few hours for the mixture to solidify. During that period the chia has enough time to absorb the liquids and soften. Pretty pops fit for a magazine page! Pretty and healthy too…a kiwi has more vitamin C than an orange & even its seeds are good for you. Regarding the milk issue: another way to prevent that dreaded icyness is with a banana. Those don’t freeze solid because of their soluble fiber. So, if you wanted to skip the coconut milk (as the person with the allergy wants) blending in a banana with regular nut milk / rice milk to a smooth puree could also work. It’s a handy sweetener as well & ought to get along with the kiwi as they’re both tropical fruits. But, with the banana in there, it might not need as much added sweetener.